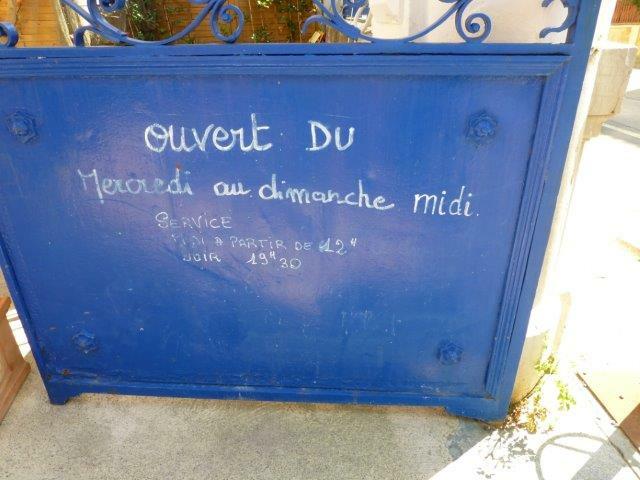 On a recent trip to Narbonne I made two discoveries, both prompted by a friend who had recently told me about them. 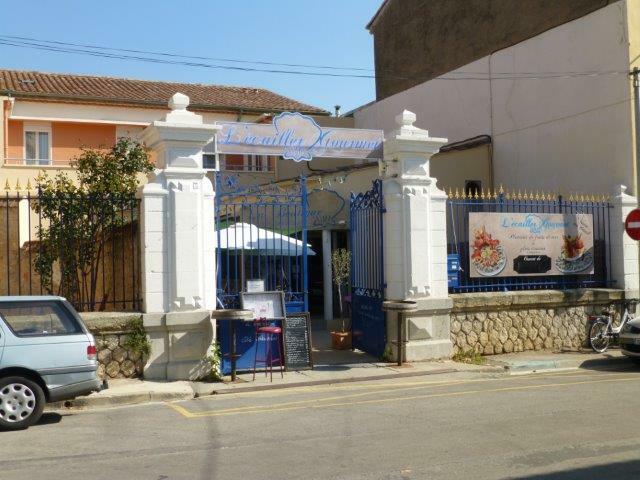 The first was a restaurant I had never before visited: L’Ecailler Gourmet, which is just behind the law courts in Narbonne. It is a restaurant which specialises in fish, and there is literally nothing else on the menu. If you don’t like fish and shellfish, don’t go there!! On the other hand, if you enjoy fish, you’ll be in heaven there! I went on a Saturday lunchtime, when the prix-fixe menus are not in operation (on weekdays the lunchtime menus are 16 and 18 Euro). Out in front there is a very nice courtyard dining area, with sun sails and umbrellas, and very comfortable outdoor furniture. Inside looked good too; I just have to tell you about the WC – it’s got the perfect decor, totally in tune with the theme of the restaurant. I won’t tell you any more, you’ll have to go and see for yourself 🙂 ! L’Ecailler Gourmet also has a shop, where you can buy fresh fish and shellfish. For starters, my dining companion and I ordered a selection of four different Tapas: marinated smoked herring, octopus, sesame prawns, and marinated anchovies. I am not sure which was the most delicious of the four – I wasn’t sure at the time and I can’t make up my mind now. The flavour of the herring was sublime and the fish beautifully tender. The anchovies were perfect, nicely spiced without being too acid. The prawns were juicy with a lovely sesame flavour. And the octopus? Firm, but without being rubbery, as octopus can so often be, and delicately flavoured with chives and peppers. For the main course my dining companion had chosen the Parillade, a combo of three different fish fillets, plus scallops and king prawns, and I had ordered a Brochette de Saumon, Lotte et Gambas, in other words salmon, monk fish and king prawns on a skewer. Before it was cooked, the fish was presented at the table – I don’t remember that ever happening before in a restaurant! 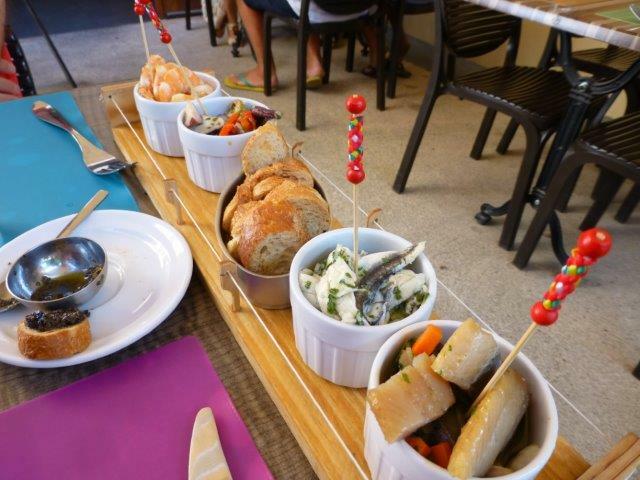 The first picture shows the Parillade, and the ingredients for my Brochette are shown on the other half of the plate. Having eaten all the tapas I was not sure I would be able to manage all the fish, but I figured that it would shrink somewhat during cooking. When the fish reappeared, this time beautifully cooked and plated, it still looked just as big, AND there were vegetables on the plate too!! We both managed just fine – the fish was perfectly cooked, juicy and tender! Monk fish can be a bit tricky to prepare. It can have a strange kind of texture, which I don’t find all that pleasant, but in this case it was just a pleasure to eat. Cooking fish is all about timing, and the chefs at L’Ecailler Gourmet have it down to a fine art. I think you’ll agree that the choices were just too tempting :)!! I opted for the millefeuille with fresh mango and Chantilly cream – pure delight – whilst my dining companion ordered the tartar of strawberries with black olives and basil. The latter was a revelation – the flavour of the strawberries was very much enhanced by the basil, and the olives added a nice kick to it. So all in all a wonderful lunch, and definitely a restaurant to recommend. If you want to visit, please call ahead to make a reservation, as it can get very busy. 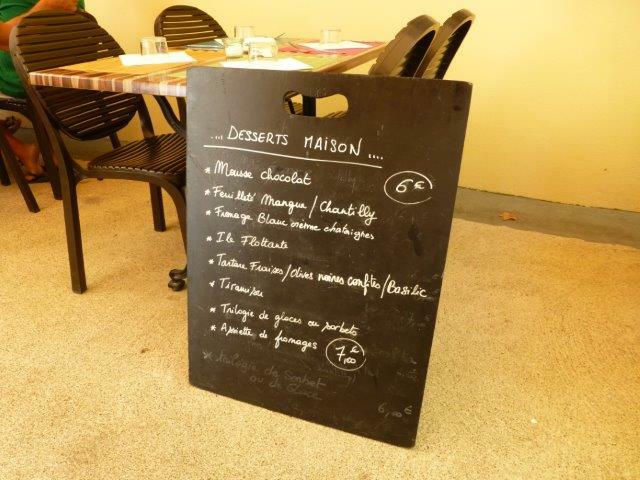 After this amount of food we definitely needed a walk, so we decided to spend some time exploring Narbonne. Here’s where my friend’s second tip came in handy: Narbonne is hosting the 2nd International Biennale of Watercolour during October. The exhibitions are spread over eight different locations in the town centre. We started with the exhibit of pictures by Henri Zuber in the hemispherical chamber at the bottom of the keep, part of the archbishop’s palace (now the town hall) on Place de l’Hotel de Ville. The room is amazing (you can climb to the top of the keep for a great view over the town), and the exhibition was delightful. The acoustics of the room are also amazing – you can clearly hear what people across the other side of the room are whispering about!! The next stop was in the Salle des Consuls, also in the archbishop’s palace. This is an impressive hall with a timber beamed ceiling, where the town nobles met to decide on the running of Narbonne. 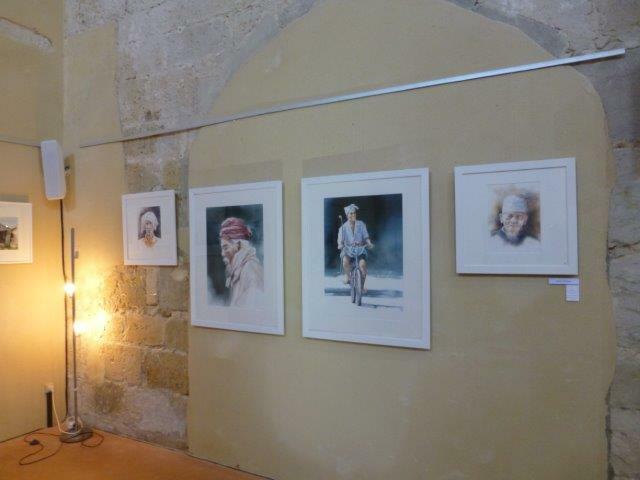 The pictures on show here were the finalists of the worldwide competition organised by the international magazine, The Art of Watercolour. 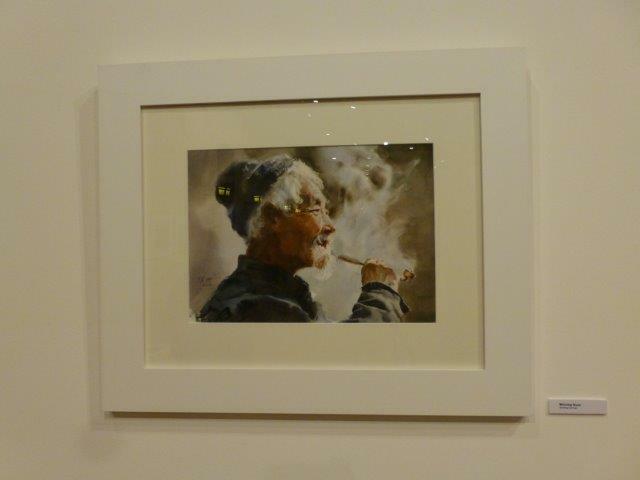 It is called Smoking old man, and painted by Weixing Guan. The young man at the desk had to make a phone call, as he did not have a price list. He was visibly embarrassed when he told me that the picture was valued at $50,000 – just like me to go for one of the most expensive pictures in the whole show!! 😀 . Our next stop was at La Poudriere, a former gunpowder store! Painters selected by the organising committee were showing their pictures here. On to our final stop that day: the Ancienne Chapelle des Jacobins – the old chapel of the former Jacobin monastery. The chapel is an incredibly lofty space, with some amazing stonework! The pictures by the Belgian painter Martine Vanparijs caught my eye, and they were very much more affordable than the painting which had so attracted me earlier in the afternoon. You could probably buy every single picture in the Ancienne Chapelle des Jacobins for the price of that one! The Biennale runs until October 26, 2014 and most of the venues are open every day. If you are in the area, do go and have a look – I am sure you will enjoy the visit!